This blog contains many articles on some of the jobs we have completed. Each article carries pictures and discusses the methods we used and how we overcame challenges on each one. Please use the search bar at the bottom right hand side of the page to search for specifics that you may be looking for. The Wood Joint pays special attention to detail in all products and focuses on durability and longevity in our products by applying sound techniques and slightly over engineering most products. We pride ourselves in our quality workmanship and use only top quality timber sourced from reputable suppliers and sustainable sources. We offer a 3 year workmanship warranty on our work. We are accustomed to working to engineers specifications and apply these throughout our work even in the absence of an engineer. A wooden sun deck is a valuable addition to any home and will not only provide many years of enjoyment, but will also enhance the value of your property. With the correct care, maintenance costs can be kept to a minimum and the life span of your wooden deck increased. We will assist you in a design that will be cost-effective and will best suit your needs taking into account the existing structure that is in place. 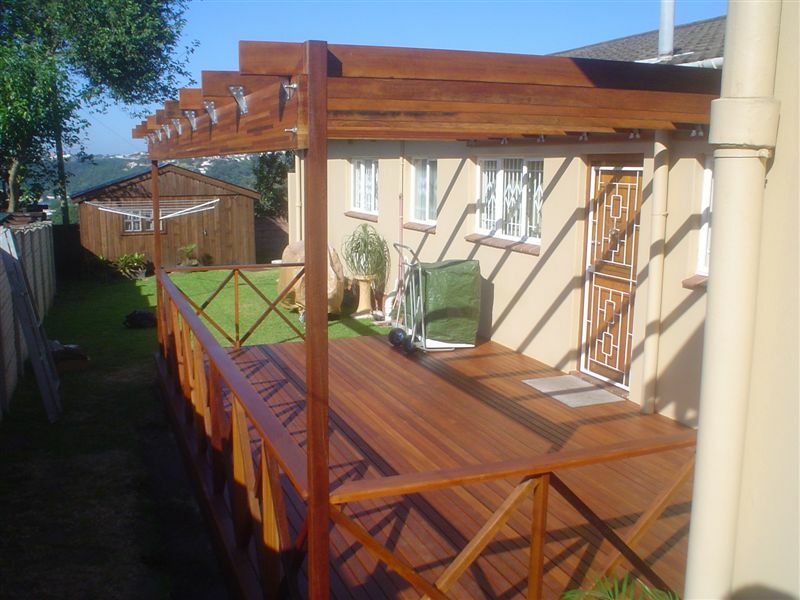 With years of experience in the wooden deck building industry, The Wood Joint can advise, design, maintain and erect your deck in the most cost-effective and structurally best methods. We us predominantly CCA treated substructures that are treated to at least an SABS H3 level which is suitable for outdoors and carries a 50 year guarantee from the supplier against rot and insect infestation. There are conditions applicable such as using the correct Hazard Level for the right application and a few others, all of which we comply with on all builds. All poles or posts that enter ground, or are in constant contact with wet soil, are treated to an H4 level. We use largely balau deck boards on the surface but can vary this to include Garappa, Massaranduba and other hardwoods. 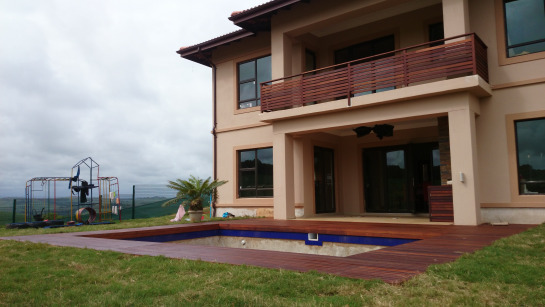 Balau is the most cost-effective of the hardwoods suitable for outdoor decking. These hardwoods contain lots of resins and oils which naturally repel water. They also contain toxins which keep the insects away. Although they cannot be CCA treated, due to their hardness and density, they are extremely durable and will last many years outdoors. They are preferred to pine for the surface because they have less tendency to warp, cup, bow or check and will remain flat for longer than pine deck boards. The cost difference between pine and balau, in deck boards, is very slight as one has to use twice as much timber when using pine as a deck board because it is half as dense. The substructure price difference however between balau and CCA pine is quite substantial (about 30%) which is why we use largely CCA pine. We can however use balau as a substructure if you would prefer. We use kalgard coated screws which are guaranteed for 25 years by the manufacturer against rust and they are counter sunk about 5mm after which we fill the screw holes with a clear epoxy and saw dust mixture to match the colour as closely as possible. We then sand the entire deck flat and seal it using Timberlife Satin Wood Base 28, an oil based timber preservative which soaks into the timber leaving no residue on the surface which can dry and subsequently peel and flake in the sun. So maintenance costs are kept to a minimum and all you do is clean and re-seal. No more sanding. You will find various articles on maintenance on this blog and we always finish our decks in a manner which will prevent costly maintenance in the future. We build our balustrades in a variety of styles from a simple criss cross to picket style to more elaborate self designed unique styles. Our stairs are normally built at 900mm wide but we can custom build stairs that are wider and incorporate special shapes. Pergolas, walkways, Jacuzzi cladding, garden bridges and screening also form part of our products. Because we source our timber in bulk, at very favourable rates, we are able to keep our prices realistic and highly competitive if not the best in town. This together with many glowing references from previous clients makes it obvious to choose us to build your wooden sun deck or related outdoor work. But don’t take my word for it, try us for yourself, or call any one of our many references. For a free, no obligation quote, or just some advice, please complete the form below or call us on 031 – 762 1795.